QuikStik Roll Stand for QuikStik Roll Adhesive Wheel Weights BOWES WW QS2000. These rugged floor stands are made to hold our various QuikStik® adhesive wheel weight rolls. 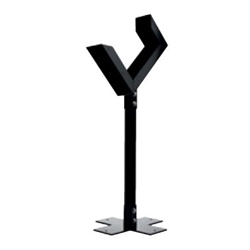 Made of steel, these stands can withstand nearly any environment. The base is wide enough to prevent easy tipping, and the head places the wheel weight box(es) at the perfect angle for a quick and easy segment removal. The QS2000 is made to hold one roll, and the QS3000 is made to hold two rolls.